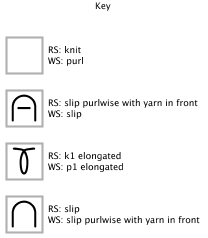 The first question is, what sort of stitch pattern to knit? Each of these grids is essentially a chart. 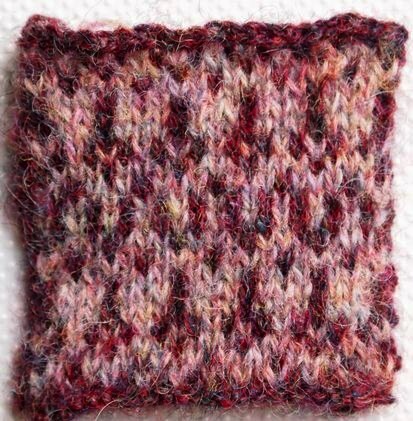 Knit with two colors of yarn with one color for the background and the other for the marked squares, and you have stranded knitting. (Also called Jacquard or more inaccurately, Fair Isle.) Some grids might also be suitable for mosaic knitting. Otherwise, you might try substituting a chart symbol for each marked square. The choices that come to my mind immediately: purl, slipped stitch, yarn over, bead, and nupp. Really, if you can put a chart symbol in a single square, try it. Yarn overs do present a special problem–and cables another–which is why I’m going to cover them in a separate post. 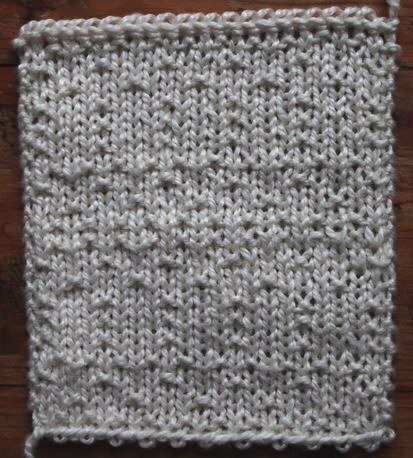 For this post, I’m going to stick to stranded knitting, purl stitches, and slipped stitches. I would love to see what else people do, however! 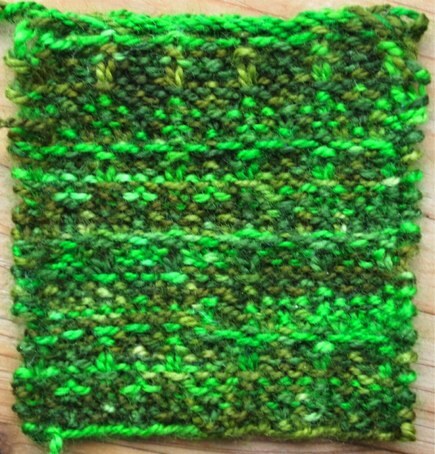 Another consideration is whether to knit pattern stitches on every row or on alternating rows; both have their merits. 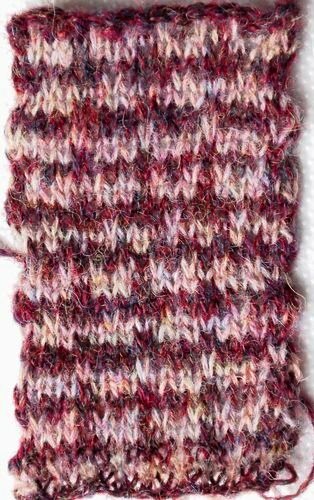 As with any stitch pattern, you may need to add selvedge stitches at the edges when knitting flat and might want to add a partial stitch repeat at one side to balance things. For the examples here, I am going to use the Base 6 grid for peace, mirrored on itself (and thus not a proper cipher). It’s a fairly dense pattern, with about a third of the squares marked. Since there’s no really long stretches of one color, it’s highly suitable for stranded knitting, so I tried it out. 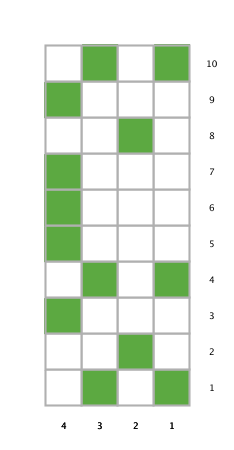 For this chart, I decided to alternate pattern rows with plain rows to help the purl bumps stand out better and to keep the vertical lines of purl from receding. It still forms a slight ribbing effect, but not as pronounced. Multiple of four stitches plus one. When you slip a stitch, you can either hold the yarn in back so that the stitch looks like a regular stitch stretched out (which it is) or with the yarn in front, so that it makes a horizontal line. This example mostly makes use of the horizontal line effect and has pattern stitches on every row. 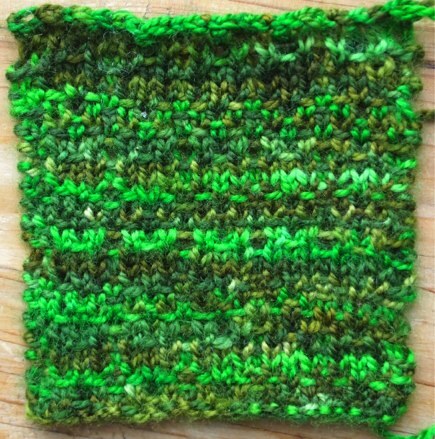 There are two rows where the yarn is held on the wrong side because the same stitch is slipped for multiple rows and this makes the slipped stitch weave in and out. 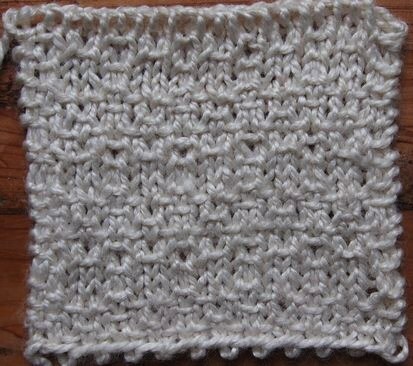 If the yarn was always held on the right side, the slipped stitch ended up being mostly hidden. Another alternative for the really elongated stitches would be to hold the yarn in back entirely for a completely different effect. Try it! One thing I like to do if I’m going to be slipping the same stitch over more than two rows is to add extra wraps to the stitch to be slipped; this helps prevent distortion. I’ve included that in the chart and instructions below. 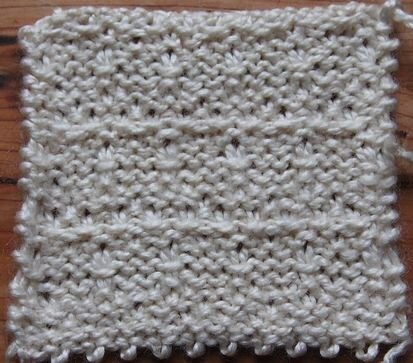 In this last example, all stitches are slipped with yarn on the wrong side. Pattern rows alternate with plain rows, and there are stripes of color. Each stripe starts on a pattern row so as to have the slipped stitches show up a bit more.